How hoax websites can help deliver news in times of conflict. Protesters open their umbrellas, symbols of pro-democracy movement, as they mark one month since they took to the streets in Hong Kong’s financial central district . If you, like me, spent this festive season looking more at the softly subdued glow of your digital devices, rather than the exploding fireworks outside, you must have come across news that made you gasp, gulp, sigh, look shocked, roll your eyes, or look up in heaven for succour — in other words, you must have had a brief encounter with an internet hoax. You might have shaken with anger at the news that the most iconic public street artist of our times, Banksy, was arrested on charges of vandalism. Or you might have quivered in terror at the thought of the Ebola virus now infecting your vegetables. You might even have jumped to the nearest grocery store, stocking up on food, water, candles and emergency supplies, after you heard about NASA’s announcement that we are heading in to six days of darkness due to a massive solar storm in December. Even if you do not respond melodramatically to these strange and bizarre news items that keep on flooding the internet, going viral before a sane voice can objectively verify (and generally debunk) them, there is that element of a split-second response that these headlines elicit from all of us. The internet, as news corporations and traditional content providers have growingly lamented, seems to be filled with dubious news of all kinds. Often, these news stories are merely a form of satire, or an ironical critique, both on the ludicrous content that our 24×7 media channels seem to be spewing these days, and the gullibility of an everyday internet user, who actually not only believes in, but also shares and tweets these stories without ever thinking about their veracity or plausibility. Most of these stories, of course, get dismissed effectively and rapidly by websites like thatsnonsense.com and hoaxbusters.com that regularly call the bluff, and even create an easy-reference directory of the hoaxes and scams that populate the digital world. Much has been said about why hoaxes like this operate and are successful. The more obvious reasons include completely reduced attention spans, viral cycles of sharing without even completely reading or processing information, the sensational nature of internet news, the rise of click-bait websites, and the ruthless competing for eyeballs in the attention economy of a very crowded information highway. We have reached a point where social portals like Facebook are even considering, using a special tag of “satire”, to mark news that originates from known humourous news websites like The Onion. In almost all the commentary around these hoaxes, however, there is a sustained insistence that these news stories are a waste of time and energy, just adding to the giant rumour mill that the social web has become, and often misleading and creating conditions of mistrust among the readers. Even those who appreciate irony and satire as effective critiques of the times we live in agree that it might be good to tag one from the other. However, there is one facet of the hoax stories that isn’t much talked about — the possibility of using hoax platforms for political protest and creative demonstration of political intent. Those who complain about the literalist nature of the Web, and the credulous nature of the users who fall for these hoaxes, fail to realise that they themselves are unable to look at the Web as more than an information delivery mechanism for gentrified content. 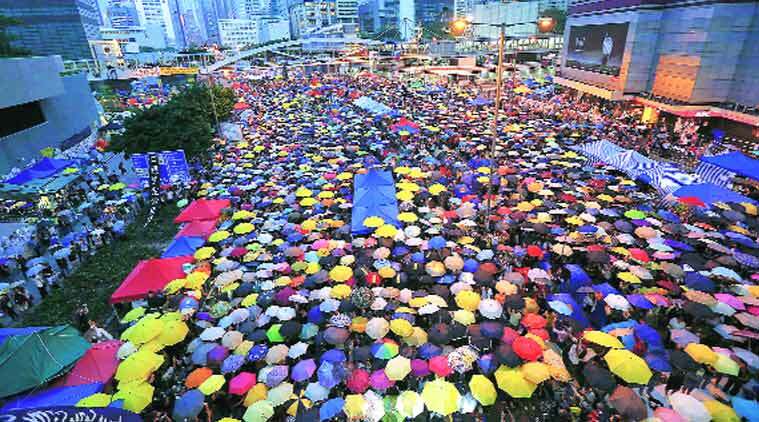 Recently, in conversation with friends, colleagues and heroes, who have been pitching their lives and energy into the political protests that have been hashtagged at #OccupyCentral in Hong Kong, I realised the huge role these otherwise dismissed hoax story platforms play in countries where freedom of speech and expression cannot be taken for granted.